Audi Unveils High Performance Wörthersee E-Bike! Next week Audi will debut their prototype Wörthersee e-bike, which promises to be a highly advanced, versatile electric bike from the German automakers. The Audi e-bike will be unveiled at Wörthersee in Carinthia, Austria where trial biker Julien Dupont and downhill specialist Petra Bernhard will demonstrate their stunts and streetbike skills. “As a high-performance e-bike for sports and trick cycling, it features the Audi core competences of design, ultra, e-tron and connect,” stated Audi’s Head of Design Wolfgang Egger. The Audi e-bike weighs 24 pounds and features a compact frame made of carbon fiber-reinforced polymer with a low center of gravity to make it superbly agile. The same carbon fiber-reinforced polymer is also used for the 26″ wheels which feature an innovative “Audi ultra blade” design with broad flat spokes for an optimized transmission of pedal power. The 2.3 kW electric motor sends up to 184 lb-ft. of torque to the rear wheel and uses a lithium-ion battery that only needs 2.5 hours to fully charge. The battery can also be easily be swapped out with a charged one during long rides. The cyclist can choose between five cycling modes that can be set using the touchscreen on the e-bike. In the “Pure” mode, the drive power is purely the product of the cyclist’s legs, while in “Pedelec” mode you are supported by the electric motor that then makes speeds of up to 50 mph possible and gives you a range of 31-44 miles. 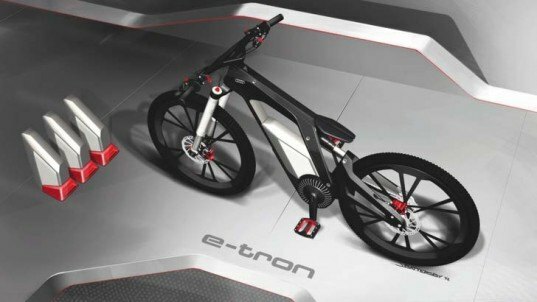 If you select “eGrip”, the Audi e-bike Wörthersee runs solely on the electric motor and can reach a top speed of 31 mph. The cyclist then controls forward momentum using a grip shift and can configure the power as desired using the computer. An electronic control system also helps the rider perform wheelies and other tricks. Different modes can be set using a smartphone or directly on the e-bike – either “Power Wheelie” mode, with adjustable wheelie angle for less skilled bikers or “Balanced Wheelie” mode for sporting challenges. In “Balanced Wheelie” mode, the electronic control system maintains the rider’s balance, by compensating the biker’s movements forwards or backwards via the electric motor. You select “Training” mode if you want to keep your performance constant for training purposes. Next week Audi will debut their prototype Wörthersee e-bike, which promises to be a highly advanced, versatile electric bike from the German automakers. The Audi e-bike will be unveiled at Wörthersee in Carinthia, Austria where trial biker Julien Dupont and downhill specialist Petra Bernhard will demonstrate their stunts and streetbike skills. 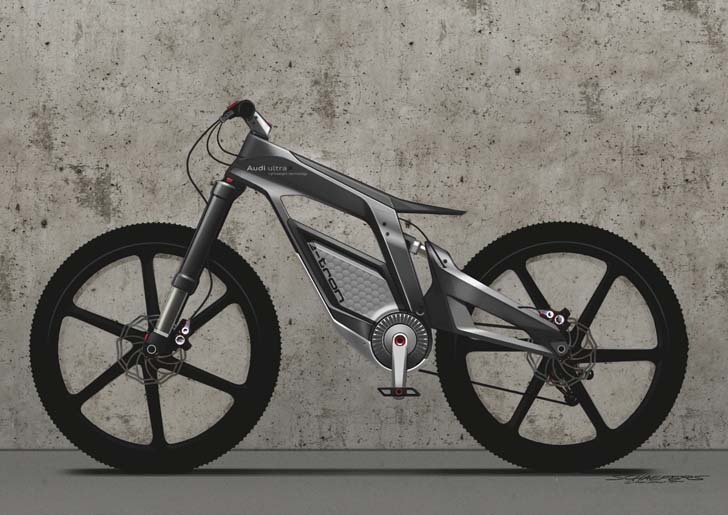 “As a high-performance e-bike for sports and trick cycling, it features the Audi core competences of design, ultra, e-tron and connect,” stated Audi's Head of Design Wolfgang Egger.